Kids Night Out | Simon Family JCC | Fitness. Family. Fun. For Everyone! 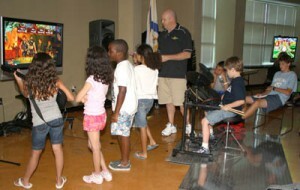 Kids Night Out, the 3rd Saturday of each month, is a program especially for JCC members. Children ages 6 weeks to 12 years are invited to join us for this evening of games, crafts, snacks, swimming (for those 4 years and up, who can swim w/o flotation devices, with lifeguard supervision) and more. These exciting theme-filled evenings are sure to bring a smile to your child’s face. Enjoy your night out while the JCC staff provides a safe, supervised and fun environment for your child – a place where they can be active, make friends, have fun and most importantly – leave parents at home! Pre-registration is required. Due to staffing requirements, drop-offs may not be able to be accommodated the day of the event. Where: Meet in JCC Lobby to Sign In; Don’t forget your bathing suit. *January 26 is the fourth Saturday of the month, April 13 & May 11 are the second Saturday of the month.